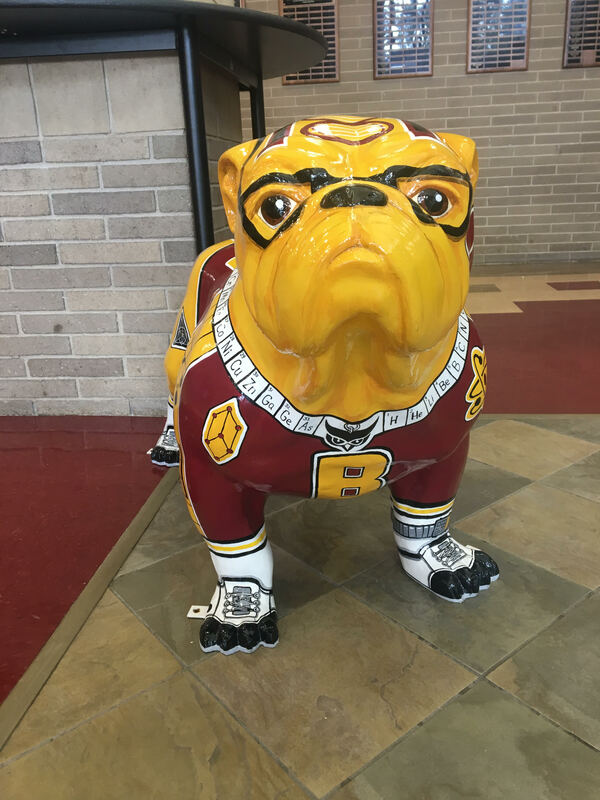 On Sat., Sept. 15, at the East Side Community Center, the Batavia Foundation for Educational Excellence, Batavia Library Foundation, and Batavia Parks Foundation hosted “Bulldogs Unleashed.” At this community event, the bulldog statues that were designed by different artists in the area and placed throughout the town were auctioned off to different buyers. The public art exhibits are being auctioned off in order to entertain the community and raise money for the three foundations. In 2011 the total combined earnings were around $75,000, and it is projected to earn around the same amount this year. “Bulldogs Unleashed” Chairman, Steven McKenna, and his wife, “Bulldogs Unleashed” Marketing Director, Britta McKenna, are both volunteers for the project. Artists were able to showcase their work from Memorial Day through Labor Day as the dogs were placed throughout Batavia. The artists have to go through a process of submitting their designs to see if they are chosen. Then, they have to see if someone will sponsor them; after that, then can finally start their bulldog. This year of the 23 artists that applied, 17 completed bulldogs. It was McKnight’s first time deciding to participate in “Bulldogs Unleashed”ed this year. “I regret not submitting a design earlier. I wish I could have gotten another bulldog and done another one,” McKnight said.